The Sakyong Wangmo, or Earth Protector Lady, is the embodied manifestation of the feminine principle. We all possess the qualities of feminine energy, gentleness and peace, and one aspect of the Sakyong Wangmo’s role is to help remind us of this. Representing the accommodating quality of space, which is the wisdom of basic goodness, the Sakyong Wangmo is an example of how to be an awakened warrior. The Sakyong Wangmo holds the vision of culture and decorum within Shambhala society. This includes manifesting peace and harmony through skillful communication and elegance. By radiating gentleness and warmth, the Sakyong Wangmo promotes enlightened leadership and uplifts our world by joining all of us in a celebration of basic goodness. The Sakyong Wangmo is also the wife and partner of the Sakyong or Earth Protector, and mother of their children. In this capacity, the Sakyong Wangmo offers strength and delight in home life, which allows the Sakyong the ground from which he can radiate his teachings out to the world. This example of family based on the principles of enlightened society is a profound offering to the larger society. 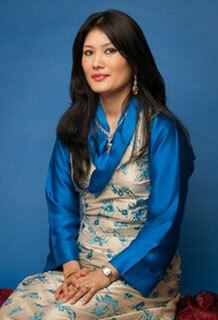 Khandro Tseyang Mukpo is the current Sakyong Wangmo, and is married to Sakyong Mipham Rinpoche. Her official Sakyong Wangmo name, given by His Holiness Penor Rinpoche at the Sakyong Wangmo Empowerment is: Pal Dechen Chöying Sangmo Pal Chokle Nampar Gyalwe De, which means Glorious Supreme Bliss Dharmadhatu Goodness Glorious Goodness Victorious in all Directions. Khandro Tseyang comes from an ancient Tibetan lineage, the Ripa family, which can trace its roots back to Marpa the Translator as well as King Gesar of Ling. Her father, His Eminence Tertön Namkha Drimed Rabjam Rinpoche, is the supreme head of the Ripa lineage of Nyingma Vajrayana Buddhism and a living Tertön, or treasure-finder. His Eminence founded the Ripa Ladrang Foundation, which funded the restoration of the original Ripa lineage monastery in Tibet, known as Rigon Tashi Chöling. His Eminence was also instrumental in building Rigon Thubden Mindroling Monastery in Orissa, India and Rigon Tashi Chöling Monastery in Pharping, Nepal, an area considered sacred to practitioners of Vajrayana Buddhism. His Eminence was a close friend of Chogyam Trungpa Rinpoche when they were both young in Tibet, receiving teachings from him that he was later able to bestow upon Sakyong Mipham Rinpoche after Chogyam Trungpa Rinpoche had passed away. Khandro Tseyang received empowerment, transmission, and instruction from many genuine lamas, including her father. In particular, she trained diligently in the entire Lingdro dance called Dechen Rolmo, Dance of Great Bliss, which is part of the set of teachings that came from the great Jamgön Mipham Rinpoche. In fact, a dancing engagement at Namdroling monastery in Mysore, India brought about Khandro Tseyang’s first introduction to Sakyong Mipham Rinpoche, the incarnation of Mipham the Great. Khandro Tseyang and Sakyong Mipham Rinpoche were married on August 15, 2005 in a private civil ceremony in Boulder, Colorado. 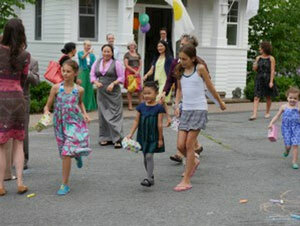 The official Buddhist wedding ceremony took place the following June in Halifax, Nova Scotia. In February 2007, the Ripa family hosted a three-day wedding celebration in Orissa, joyfully honoring the couple and the auspicious connections between their families and lineages. In early 2010, the Sakyong and Sakyong Wangmo announced that they were expecting their first child. 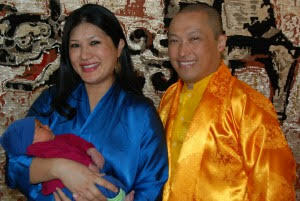 On August 11, 2010, they welcomed Jetsun Drukmo Yeshe Sarasvati Ziji Mukpo to the world. Jetsun Drukmo was born in Halifax on the first day of the Tibetan new moon. 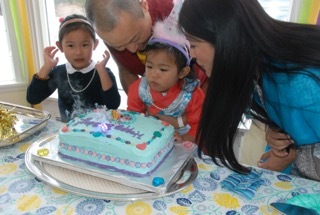 Two and a half years later, on March 14, 2013, the Sakyong and Sakyong Wangmo welcomed their second daughter Jetsun Yudra Lhamo Yangchen Ziji Mukpo into their family. Her name means Turquoise Princess Thunder Melodious Lady of Brilliance; she is known as Jetsun Yudra. Today, Jetsun Drukmo and Jetsun Yudra are vibrant, bright, playful girls who enjoy family life and play time with friends at the Kalapa Courts in Boulder and Halifax. They are also adoring sisters to the newest member of their family. On April 10, 2015, the Sakyong Wangmo gave birth to her third daughter Jetsun Dzedron Okar Yangchen Ziji Mukpo — Princess Lamp of Beauty. Following the inspiration of the Sakyong Wangmo, the Office of Culture and Decorum held its first-ever Shambhala Culture and Decorum Conference in March 2014. The three-day conference was attended by 60 participants from more than 20 Shambhala Centers and featured talks, presentations and panel discussions. The highlight of the conference came on the second day, when the Sakyong Wangmo gave her first formal talk. She spoke of her family lineage and paid homage to the strong women practitioners who raised her, including her grandmother and her mother Chime Drolkar, thanking them for the wisdom, compassion and kindness they shared with her. Over the years, the Sakyong Wangmo has undertaken a variety of projects for the benefit of the Shambhala sangha and its extended community. Under the auspices of The Sakyong Foundation, the Sakyong Wangmo Fund was established in 2013 to support humanitarian projects that improve the living conditions for Tibetans in exile. 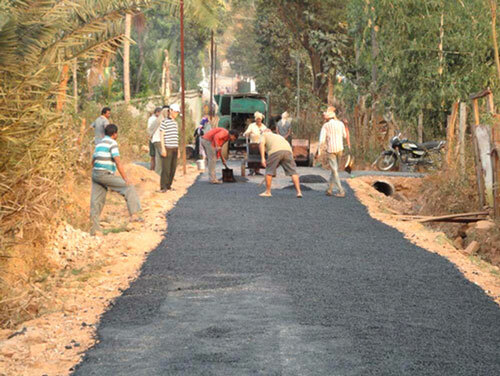 A top priority has been helping the Tibetan community in Orissa continue to build roads among the Phuntsokling settlement camps in Chandragiri. The unpaved roads are difficult to travel and can be dangerous. And without proper drainage, pools of water collect, creating a breeding ground for mosquitoes and malaria. To date, two of the roads connecting the five settlements have been built, easing the struggle of daily life for thousands of people and reducing the risk of contracting malaria, which can cause unnecessary illness and death. With funding from the Sakyong Wangmo Fund, the road to camp No. 5 was most recently completed. The next phase of this important project is currently being planned. All donations to the Sakyong Wangmo Fund, whether large or small, make a meaningful difference to this humanitarian effort.